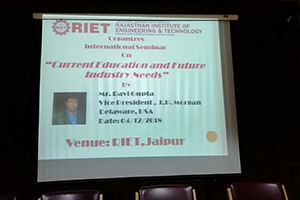 The Rajasthan Institute of Engineering & Technology organized an International Seminar on Current Education and Future Industry Need on 04.12.18 eminent guest speaker who graced the occasion was Mr Ravi Gupta who is the Vice President of J P Morgan Chase & Co, Delaware, USA. 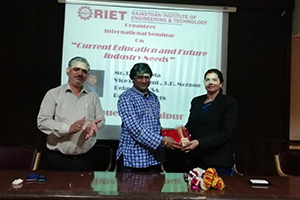 On the onset of the session Mr Ravi Gupta was welcomed by, Principal RIET Dr Saroj Hiranwal. 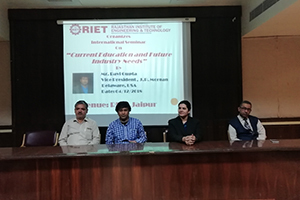 Other dignitaries who graced the occasion were- Dean Academics & Admin, RIET, Prof. Kapil Dev Sharma and Prof D D Johari, Advisor Training and Placement, RIET. 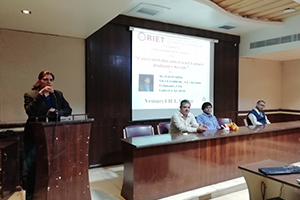 The talk was attended by all HODs, students and faculty members of RIET. Mr Ravi Gupta, Vice President of J P Morgan Chase & Co, Delaware, USA, is working with this prestigious organization since last 20 years in USA. J PMorgan Chase & Co. is a leading global financial services firm with assets of $2.4 trillion and operations in more than 60 countries. With a history dating back over 200 years, the firm serves millions of consumers, small businesses and many of the world’s most prominent corporate, institutional and government clients. The firm is a leader in investment banking, financial services for consumers, small business and commercial banking, financial transaction processing, asset management, and private equity. Mr Ravi Gupta, formerly, was a Senior Scientist at ISRO SATELLITE CENTRE, Bangaluru, and was connected with the organization for 6 years. He has also to his credit his contribution for INSAT and IRS space crafts where he designed and developed them. Mr Ravi Gupta, has studied at Engineering college Kota, University of Rajasthan, and has done BE in Electronics and Communication. 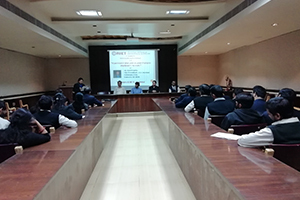 Mr Ravi Gupta said that during the last couple of decades the young talents are increasing but they are not able to judge their future because of many opportunities in front of them. This is making them go wherever they feel like but not in a correct direction. Educational institutions are facing new challenges resulting from technological driven changes in teaching and learning, globalization of higher education and changes in the economic climate. The welcome note on this occasion was extended Principal RIET Dr Saroj Hiranwal. Speaking on the occasion she said that said that we believe that the responsibility of the institution is to give knowledge beyond the syllabus education to students to qualify their academic. We take additional responsibility to support them in making a right start of their career. We also give quality education to our students to make them skilled experts. We aim at building a complete personality in our students, professionally, socially and morally. We also need to bridge the gap between Education and the Industry needs, as there is a breach between skills and learning. 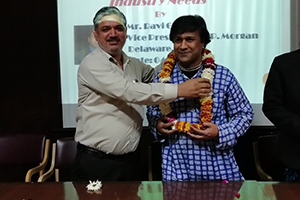 Dean Academics & Admin, RIET, Prof. Kapil Dev Sharma, thanked the guest speaker Mr Ravi Gupta and said that RIET looks forward to many such occasions and quality education from such distinguished orators.